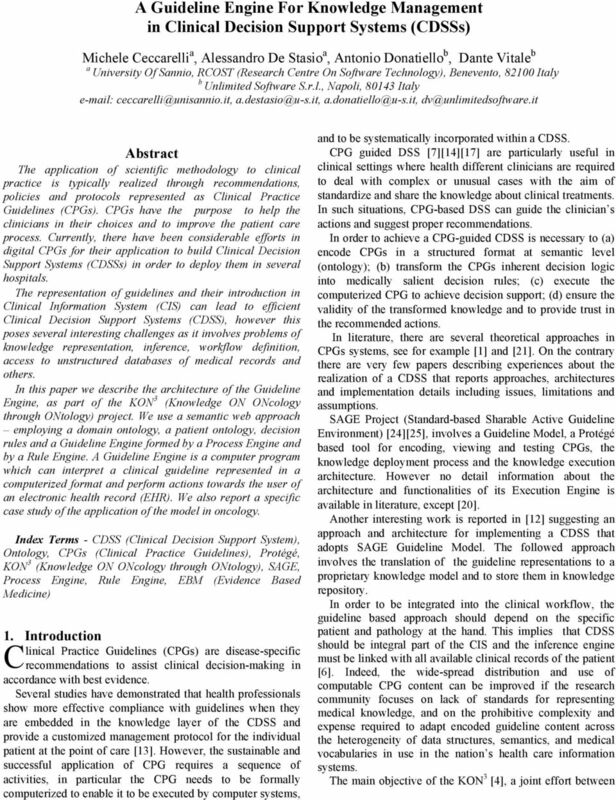 Download "A Guideline Engine For Knowledge Management in Clinical Decision Support Systems (CDSSs)"
2 companies, university and regional government agencies, is to obtain a sharable knowledge based on CPG at a reasonable cost and in a form that can be integrated into the clinician s workflow. 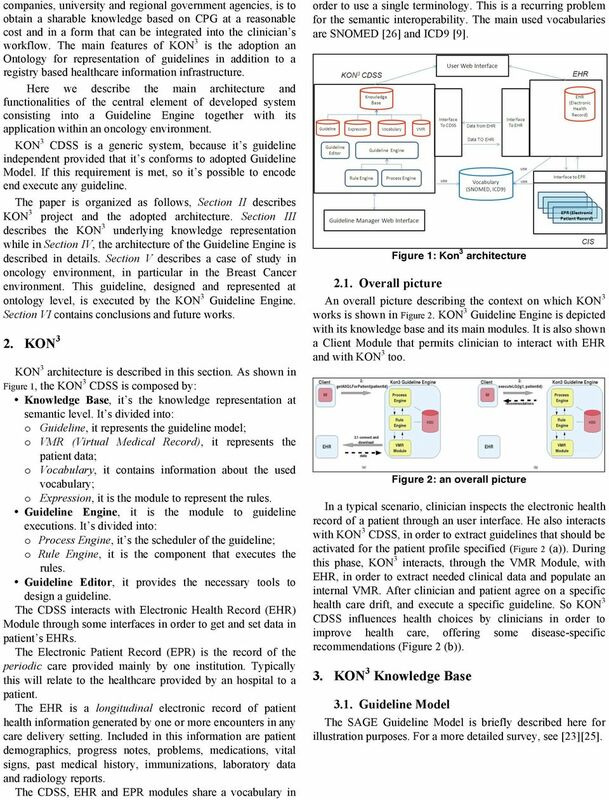 The main features of KON 3 is the adoption an Ontology for representation of guidelines in addition to a registry based healthcare information infrastructure. Here we describe the main architecture and functionalities of the central element of developed system consisting into a Guideline Engine together with its application within an oncology environment. 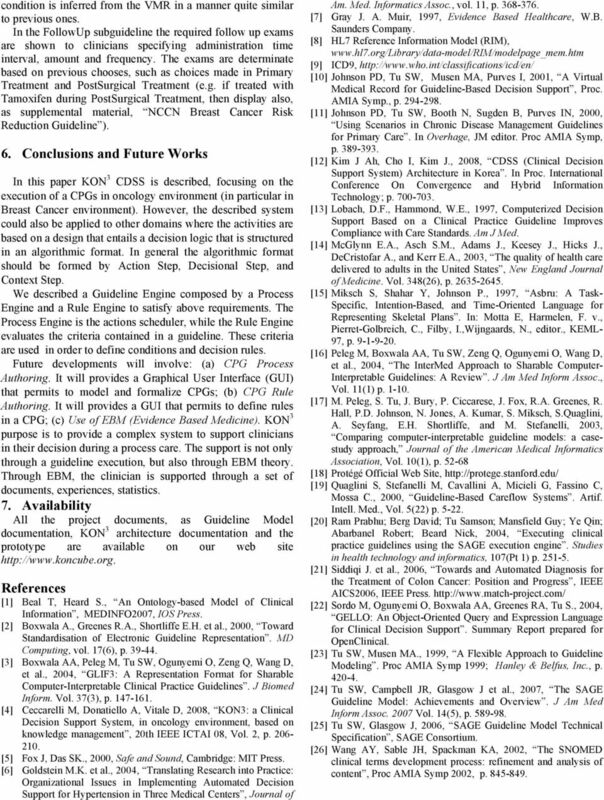 KON 3 CDSS is a generic system, because it s guideline independent provided that it s conforms to adopted Guideline Model. If this requirement is met, so it s possible to encode end execute any guideline. The paper is organized as follows, Section II describes KON 3 project and the adopted architecture. Section III describes the KON 3 underlying knowledge representation while in Section IV, the architecture of the Guideline Engine is described in details. Section V describes a case of study in oncology environment, in particular in the Breast Cancer environment. This guideline, designed and represented at ontology level, is executed by the KON 3 Guideline Engine. Section VI contains conclusions and future works. 2. KON 3 KON 3 architecture is described in this section. As shown in Figure 1, the KON 3 CDSS is composed by: Knowledge Base, it s the knowledge representation at semantic level. 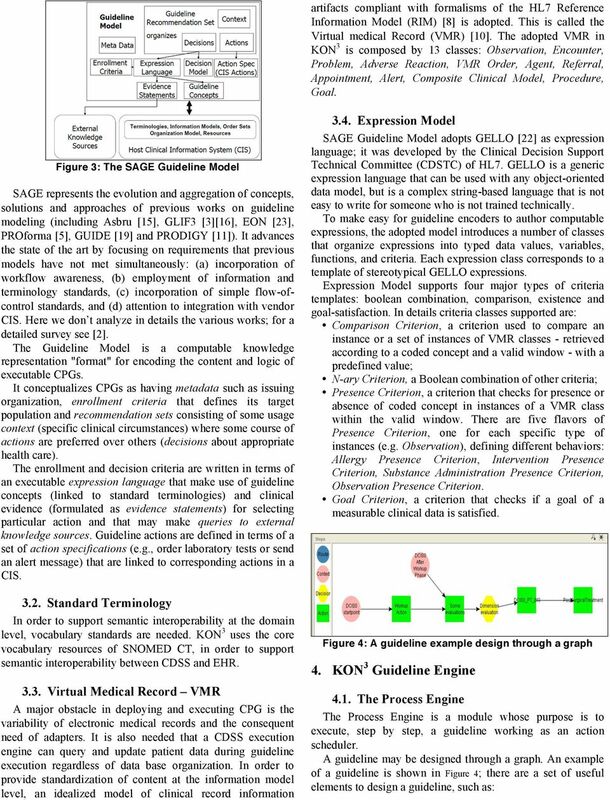 It s divided into: o Guideline, it represents the guideline model; o VMR (Virtual Medical Record), it represents the patient data; o Vocabulary, it contains information about the used vocabulary; o Expression, it is the module to represent the rules. 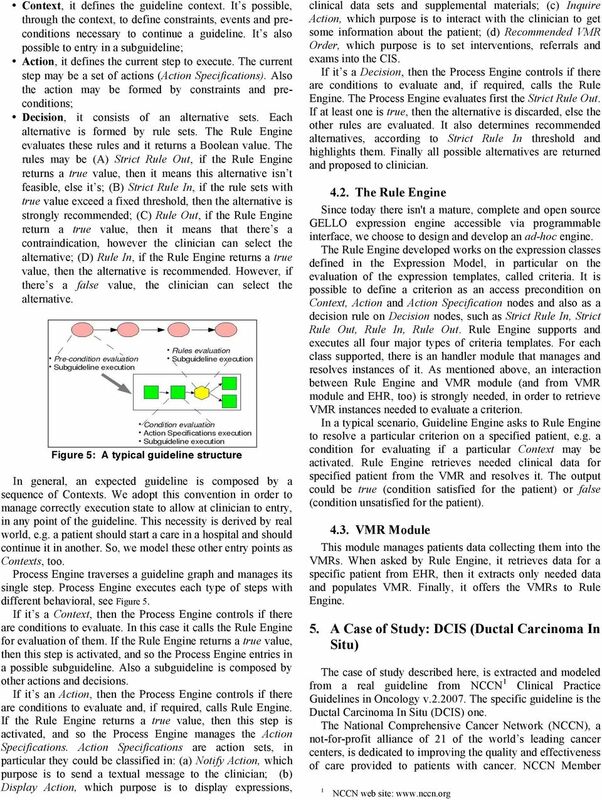 Guideline Engine, it is the module to guideline executions. It s divided into: o Process Engine, it s the scheduler of the guideline; o Rule Engine, it is the component that executes the rules. Guideline Editor, it provides the necessary tools to design a guideline. The CDSS interacts with Electronic Health Record (EHR) Module through some interfaces in order to get and set data in patient s EHRs. The Electronic Patient Record (EPR) is the record of the periodic care provided mainly by one institution. Typically this will relate to the healthcare provided by an hospital to a patient. The EHR is a longitudinal electronic record of patient health information generated by one or more encounters in any care delivery setting. Included in this information are patient demographics, progress notes, problems, medications, vital signs, past medical history, immunizations, laboratory data and radiology reports. The CDSS, EHR and EPR modules share a vocabulary in order to use a single terminology. This is a recurring problem for the semantic interoperability. The main used vocabularies are SNOMED  and ICD9  Overall picture Figure 1: Kon 3 architecture An overall picture describing the context on which KON 3 works is shown in Figure 2. KON 3 Guideline Engine is depicted with its knowledge base and its main modules. It is also shown a Client Module that permits clinician to interact with EHR and with KON 3 too. Figure 2: an overall picture In a typical scenario, clinician inspects the electronic health record of a patient through an user interface. He also interacts with KON 3 CDSS, in order to extract guidelines that should be activated for the patient profile specified (Figure 2 (a)). During this phase, KON 3 interacts, through the VMR Module, with EHR, in order to extract needed clinical data and populate an internal VMR. After clinician and patient agree on a specific health care drift, and execute a specific guideline. So KON 3 CDSS influences health choices by clinicians in order to improve health care, offering some disease-specific recommendations (Figure 2 (b)). 3. KON 3 Knowledge Base 3.1. Guideline Model The SAGE Guideline Model is briefly described here for illustration purposes. For a more detailed survey, see . Patient Centered Medical Homes and Meaningful EHR Use: Competing for Scarce Resources or Dynamic Synergy? 7/31/2015. Shelly Spiro, Executive Director, Pharmacy HIT Collaborative reports no relevant financial relationships. WHITE PAPER Clintegrity 360 QualityAnalytics Bridging Clinical Documentation and Quality of Care HEALTHCARE EXECUTIVE SUMMARY The US Healthcare system is undergoing a gradual, but steady transformation.